We’ve had a busy few months so far in 2016 playing at several really exciting and varied festivals and venues. Firstly our regular night at the Trinity Rooms, Stroud in February was fantastic fun and a great way to dance off the dreary feeling of winter brining in the light for the year ahead. Thanks to all the stall holders and food makers for coming along and making the evening so special. In March we had the squeezed into the Passage to India, Nailsworth to support the Nailsworth Refugee Action fundraising event with some live music in return for some popadoms, sabzi, samosas and interesting talks by well known speakers. Following on we had a great time playing a the Christian Arts Festival, Cheltenham in a spacious lecture theatre with Paul and Fiona, giving our new sound guru Steve a chance to try out his rig of speakers, desks and lights. 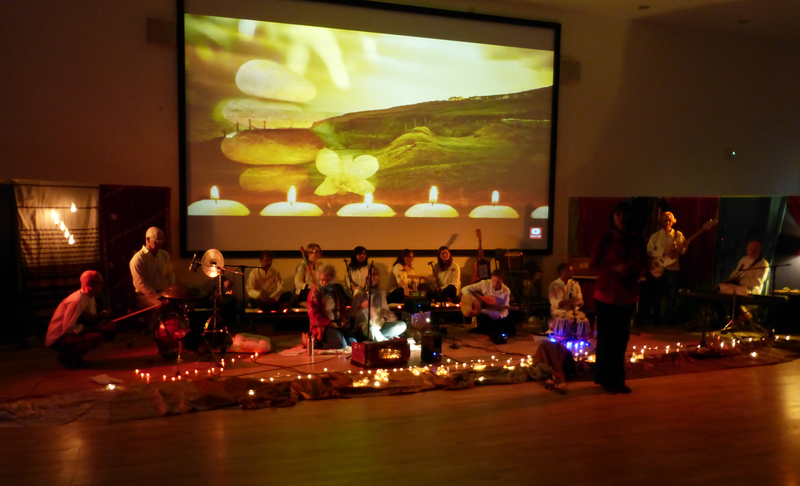 Also in May, we put in an appearance at the UK Bhakti Gathering at Osho leela in Dorset. 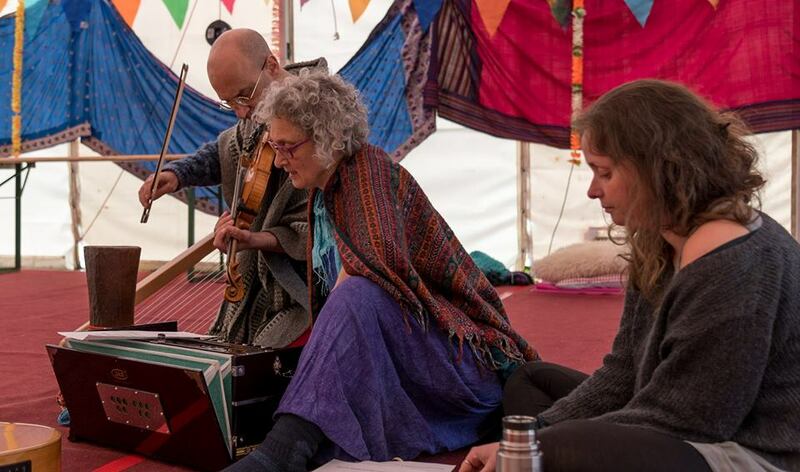 Some of us stayed for the weekend, camping out through the frosty night and enjoying some incredibly talented Bhakti musicians and singers over the immersive 3 day festival. Such an inspirational and enjoyable weekend with new bhajans by Tim Chalice, the serenely beautiful vocals of Sivani Mata, fire and energy from the Babaji Temple singers and much much more…. Most recently though the fundraiser last night for the Sacred Music Festival in July was an absolute blast. 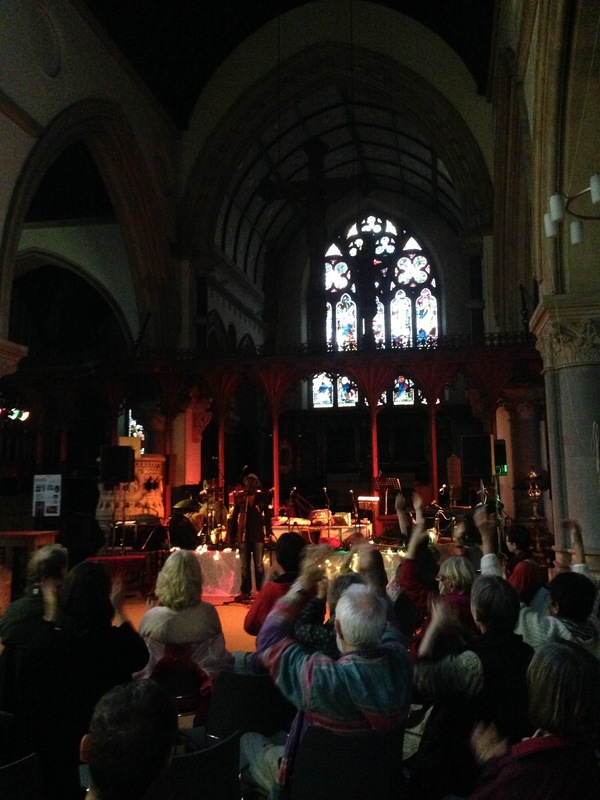 A fantastic warm up of Taize chanting and animated beatboxing and gospel singing from the wonderful Jean Paul Wabotai really got us all going in the sublime ambiance for St Laurence church, Stroud. Join us again on Friday 1st July for the opening of the Sacred Music Festival where we’ll be supporting the Ganda Boys back from their recent trip to LA to spread the word of the Forgotten People!